There’s nothing better than when Instagram friends become real friends, amiright?! Well, that may be a bit of an overstatement but it undoubtedly IS awesome – especially when you hit it off as well as I did with these sweet clients! 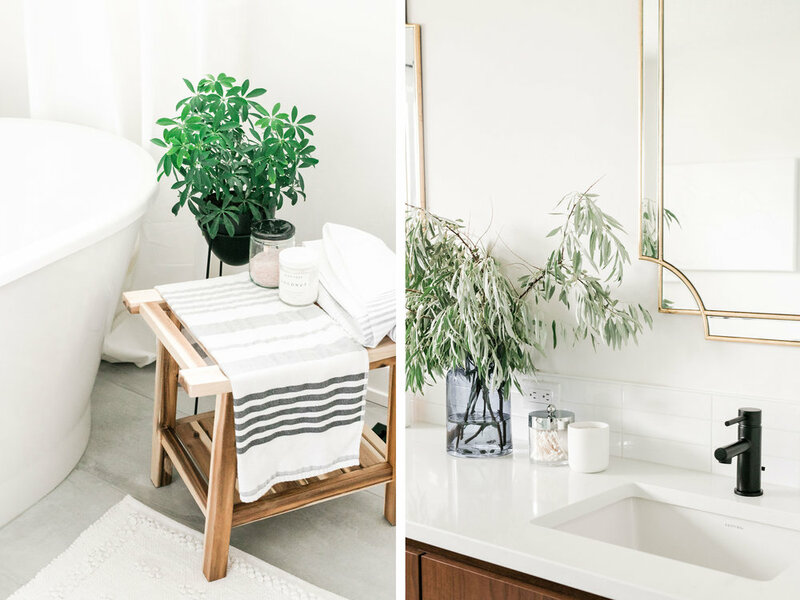 Alyssa Conrad, founder of Calgary’s Pearl & Dot, and I had been virtually following along with each other for some time before she reached out last year to see if I had any interest in helping her and her boyfriend with the redesign of their new home. My answer: uhhh YES!! Alyssa and Derek were in the process of closing on the purchase of a super-cool 60s bungalow when we first connected. This is a housing type that is very near and dear to my heart (see my first major renovation, the Briar Hill House here!). 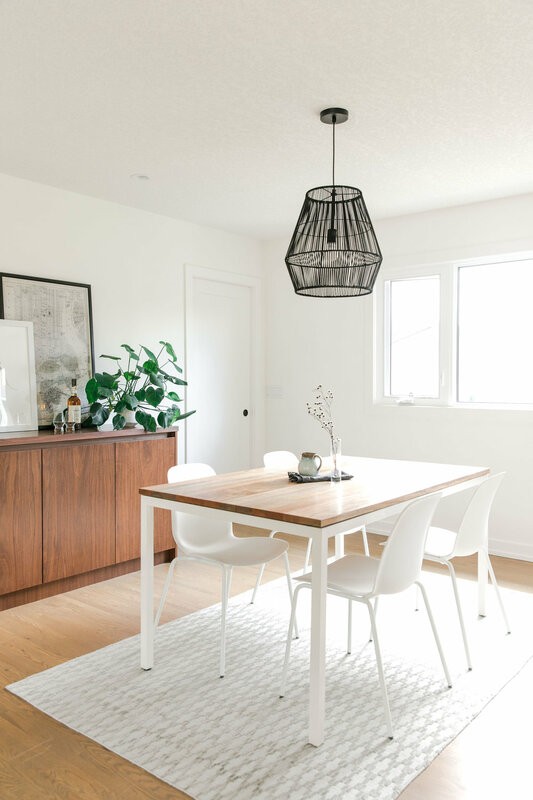 I love the general layout and feel of 60s-style homes, and I was particularly excited when I learned that although the clients wanted to update their new home, they also wanted to maintain some of the original character wherever possible and appropriate. After discussing their wants and needs (and establishing a project hashtag + instagram account, #keepitonthebungalow + @keepitonthebungalow 😉), we got right into the planning phase. The original layout featured a boxed-in kitchen, which not only closed it off from the rest of the living space, but created a very isolated, cramped dining room. The existing powder room doubled as the ensuite, accessed not only through the master bedroom, but also the very tight back entry located off the kitchen. 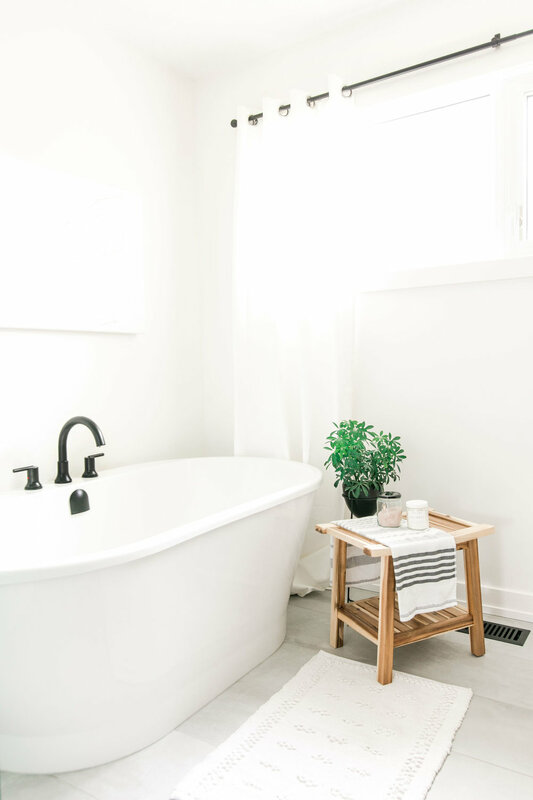 Alyssa and Derek’s wish list included an open floor plan, the addition of a private master ensuite + walk in closet, and a decent-sized mud room for their (future!) pup. 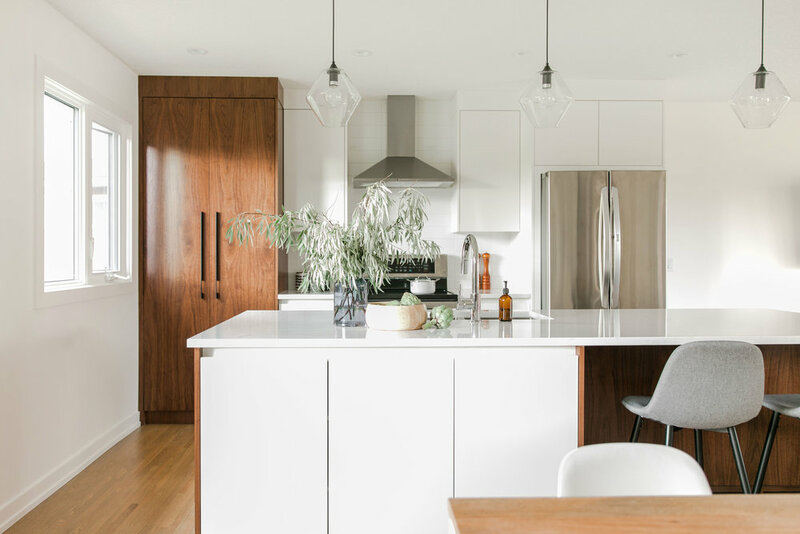 After reviewing a few options with Brendan of Miter Renovations, the clients settled on a layout that not only opened the kitchen up, but relocated it entirely, allowing for a much bigger feel in the space as well as far better circulation. The original house contained 3 moderately-sized bedrooms on the main level, which was unnecessary for Alyssa and Derek considering the full basement below. We reconfigured the plan by nixing one of the smaller bedrooms in favour of a larger master bedroom, a sizeable walk-in closet, and a master ensuite bathroom. The result is a home that feels infinitely bigger, more up-to-date, and both modern and inviting! 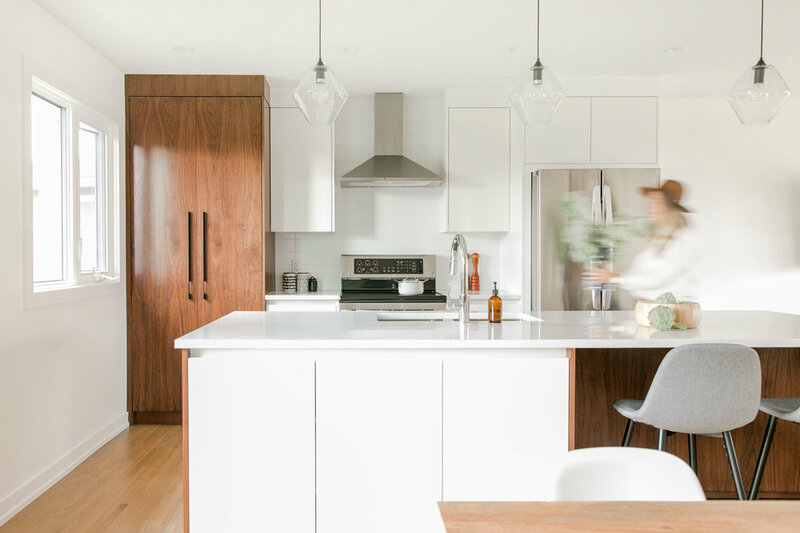 The mid-century modern millwork throughout is sleek, yet warm due to its materiality in warm, rich walnut wood. Other than the natural wood tone, we generally kept the rest of the finishes in a monochromatic palette of black, white and grey; this kept the feel contemporary but not too cool, and highlighted the original hardwood floors, which we had patched and refinished in a new stain to complement the updated look. 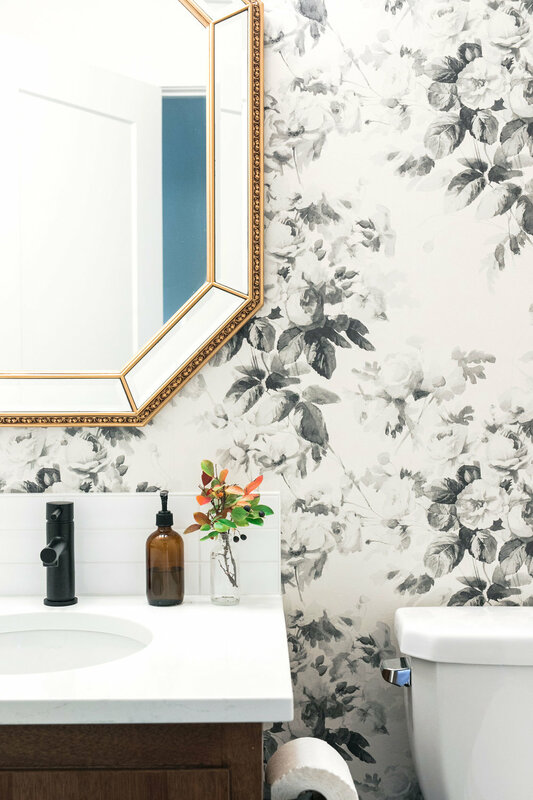 We also salvaged the original bathroom vanity and living room built-ins, which were updated with a new quartz countertop and fresh coat of paint, respectively. The master ensuite feels particularly luxurious, complete with an oversized custom shower and freestanding bathtub. It also definitely helps that Alyssa found the perfect vanity lights and mirrors to complete the space! Gotta love when your client’s taste is SO on-point! !